Secretary of Defense James Mattis has issued his initial campaign plan for rebuilding America’s military, pursuant to a presidential directive signed January 27. If Congress provides necessary funding, the Mattis plan would reverse a steady erosion of the joint force’s warfighting edge that resulted from caps on military spending during the Obama years. In fact, the plan may usher in a surge of spending on new military technology unlike anything seen since the Reagan years. All four of the military services General Mattis oversees would get a boost, but the biggest beneficiary during President Trump’s tenure will be the service that is currently in the direst straits — the Army. That’s because the fixes the Army needs can be implemented more quickly than expanding the Navy’s fleet or fielding a new Air Force bomber. In fact, making the Army healthy again could be largely accomplished during Trump’s first term — which is a good thing since it is pivotal to deterring East-West war in Europe. Governments and security services across Europe have sounded public warnings about Russian interference in upcoming elections, amid mounting concern about a spate of cyber attacks on political parties and government institutions. Officials and security officers in France, Germany, and the Netherlands have agreed to share information as they brace for “influence operations,” including the leaking of hacked emails and using internet bots to spread fake or misleading news on social media, in the run up to presidential and general elections this year. North Korea has successfully test-fired a new type of medium-to long-range ballistic missile, claiming further advancement in a weapons programme it is pursuing in violation of United Nations resolutions. North Korea fired the ballistic missile on a high arc into the sea early on Sunday, the first test of U.S. President Donald Trump‘s vow to get tough on an isolated regime that tested nuclear devices and ballistic missiles last year at an unprecedented rate. The North’s state-run KCNA news agency said leader Kim Jong Un supervised the test of the Pukguksong-2, a new type of strategic weapon that can launch faster, is easier to hide from satellites and is capable of carrying a nuclear warhead. KCNA said the missile was fired at a high angle in consideration of the safety of neighbouring countries. 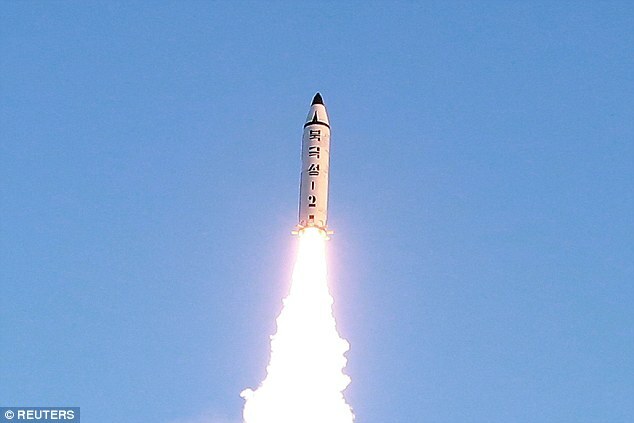 A South Korean military source said on Sunday the missile reached an altitude of 550 km (340 miles). The ballistic missile that North Korea claimed it successfully test-fired over the weekend is designed to launch from a submarine, U.S. officials told Fox News on Monday. Trump would send a ‘signal’ after a new North Korean missile test by asking Congress to give more money to the military, Miller added in his appearance on CBS News’ Face the Nation Sunday. U.S. national security adviser Michael Flynn enjoys the “full confidence” of President Donald Trump, a top White House adviser said on Monday, as Flynn tries to survive a controversy over his contacts with Russian officials before Trump took office. “Gen. Flynn has the full confidence of the president,” White House counselor Kellyanne Conway told reporters. WASHINGTON—The White House is reviewing whether to retain National Security Adviser Mike Flynn amid a furor over his contacts with Russian officials before President Donald Trump took office, an administration official said Sunday. Mr. Flynn has apologized to White House colleagues over the episode, which has created a rift with Vice President Mike Pence and diverted attention from the administration’s message to his own dealings, the official said. “He’s apologized to everyone,” the official said of Mr. Flynn. Flynn is the one senior US intelligence officer with the guts to blow the whistle on a series of catastrophic intelligence and operational failures. The available facts point to the conclusion that elements of the humiliated (and perhaps soon-to-be-unemployed) intelligence community is trying to exact vengeance against a principled and patriotic officer. When the Turkish smear against Flynn came out in November, I smelled a rat. The present affair stinks like a dumpster full of dead rats. Michael Flynn out side door, establishment in back door? The possible ouster of US National Security Advisor Michael Flynn could herald the return of the influence of Henry Kissinger. What seems to be the likelihood that US National Security Advisor Michael Flynn is on the verge of losing his job could be the second bloodied nose for hard-charging insiders of the Donald Trump administration. Flynn and his possible demise was the hot topic on the US Sunday talk-show circuit after reports surfaced that conversations he had with Russian Ambassador Sergei Kisilyak included US sanctions on Russia. Beside the sensitivity of such issues, it seems Flynn lied about it to US Vice President Mike Pence. According to officials at the US National Security Council the Flynn affair ranks as the second bloodying after what was handed out to White House Chief Strategist Steve Bannon and Trade Chief Peter Navarro. At least 72 convicted terrorists came from the seven countries President Trump targeted in his extreme vetting executive order, according to a new report this weekend that directly undercut part of the courts’ rulings halting the program. Seventeen of those entered the U.S. under the refugee program that Mr. Trump has said is of special concern to him, according to the data compiled by the Senate Judiciary Committee and analyzed by the Center for Immigration Studies. The convictions came in terrorism-related investigations since the Sept. 11 attacks, but some were for relatively minor crimes such as identity fraud. Nevertheless, more than 30 of the convicts served at least three years in prison because of their terrorism-related crimes, the CIS report said. Yahya Sinwar, considered one of Hamas’s most ruthless leaders, has been elected as the terror group’s leader in the Gaza Strip, a Hamas official confirmed Monday. Sinwar, 55, generally avoids the limelight, but is seen as an unpredictable hardliner who inspires the loyalty of Hamas’s military wing’s leadership. He will replace Ismail Haniyeh, who is running for the leadership of Hamas’s political bureau to succeed Khaled Mashaal. Sinwar, sentenced to life in 1989 for murdering Palestinian collaborators with Israel, spent 22 years in Israeli prisons before being released in the 2011 prisoner exchange deal for IDF soldier Gilad Shalit. A Ryanair passenger was detained under the Terrorism Act after he tried to allegedly smuggle a pipe bomb in his luggage through security at Manchester airport. Nadeem Muhammed, 43, was allegedly found with the device as he tried to board a Ryanair flight to Bergamo, Italy from Manchester Airport. But after the explosive substance was discovered he was released on bail and allowed to leave the country days later. Frank-Walter Steinmeier, the former German foreign minister who was a vocal critic of Donald Trump during the U.S. campaign, was elected as the country’s 12th postwar president. The Social Democrat, who served two stints as foreign minister under Chancellor Angela Merkel, emerged as her governing coalition’s candidate last November as the parties sought to avoid a political spat over the appointment in an election year. With the support of Merkel’s Christian Democratic-led bloc and the Social Democrats in a special assembly on Sunday, Steinmeier was elected in the first round to the mostly ceremonial post. Lockheed Martin has spent over $1 billion on reciprocal procurement since 2010 when Israel signed deals for F-35 fighter jets. Since 2010, when the Ministry of Defense signed the first of three deals for procuring 50 F-35 stealth fighters, US manufacturer Lockheed Martin has spent over $1 billion on reciprocal procurement from Israeli defense companies, the Ministry of Defense Procurement and Production Directorate (PPD) announced today.The first two F-35s ordered from the US landed in Israel last December. The rest will be supplied in the coming years, eventually giving the Israeli air force two full squadrons of F-35s (called Adir). The figures disclosed by the Ministry of Defense today show that in 2016, Lockheed Martin expanded its commercial contracts with some of the Israeli companies involving the supply of parts and systems related to the plane. Lockheed Martin’s procurement from Israeli defense companies jumped 33%, compared with 2015, with orders totaling $258 million. More than 53,000 of the images have been smuggled out of Syria by a military police photographer, known as Caeser. Pictures have emerged showing the emaciated corpses of inmates from prisons run by the Syrian regime. The images are so graphic that it has now been branded a 21st century holocaust. They show the conditions of the victims of the prisons run by President Bashar Assad’s regime who are said to have been deprived of food, water, medicine and subjected to months of torture. And UN experts have compared the atrocities to scenes from Jewish concentration camps, 70 years before, according to the Mail on Sunday. MOSCOW, February 13. /TASS/. Russia will conduct an inspection on Turkey’s territory as part of the Vienna Document on Confidence and Security-Building Measures starting on February 13, head of the Russian National Nuclear Risk Reduction Center Sergei Ryzhkov said. According to him, Russia also plans to carry out an observation flight over Italy. “Between February 13 and 16, a group of Russian experts plans to inspect Turkey’s territory in accordance with the 2011 Vienna Document on Confidence and Security-Building Measures… An area of 18,000 square kilometers will be inspected,” he said. The Vienna Document, adopted by the Organization for Security and Cooperation in Europe (OSCE) in November 2011, stipulates inspections of specific territories in order to monitor and control military activities. The document envisages up to three annual inspections. According to Ryzhkov, Russian experts will visit training centers and shooting ranges as well as attend briefings of the Turkish military commanders. Besides that, Russia will also conduct an observation flight over Italy on an An-30B aircraft on February 13-17. “An observation flight with a maximum range of up to 2015 kilometers will be conducted on February 13-17 from the Ciampino airfield. A Russian aircraft will conduct the flight in accordance with the route agreed on with the country’s authorities, while Italian experts aboard will control the use of surveillance equipment,” Ryzhkov added. Iraqi warplanes have hit a house where ISIS leader Abu Bakr al-Baghdadi was holding a meeting with senior commanders, killing at least 13. Baghdadi’s name was not on a list of the dead published by the military following the attack on the western city of Anbar, on Saturday. At least 64 lower-ranked IS fighters were killed in the same wave of air strikes in western Iraq, the statement added. BERLIN — The U.S. Army has begun unloading dozens of Chinook, Apache and Black Hawk helicopters at a port in northern Germany so the aircraft can be moved to a base in Bavaria. German news agency dpa reported Sunday that 94 helicopters and several trucks from the 10th Combat Aviation Brigade in Fort Drum, New York, were sent to the port of Bremerhaven. Most of the equipment is bound for an Army base in the town of Illesheim, but dpa says some will be assigned to rotating stints in Lithuania and Romania. Matteo Renzi’s chances of recapturing the Italian prime minister’s office this year may be slipping away. His push for early elections has triggered so much dissent within his own party that he may have to wait until next year for a comeback attempt. The ex-premier’s Democratic Party, the biggest force in parliament, holds a meeting of its leaders in Rome on Monday. They’ll decide whether to seek national elections this year, or wait until a vote scheduled for early 2018. Should Renzi prevail on Monday, there is the prospect of yet another European election alongside Germany, France and the Netherlands this year. The anti-establishment Five Star Movement, which wants a referendum on Italy’s membership of the euro area, is keen to exploit its standing in opinion polls that show it neck and neck with the Democratic Party. This article was originally posted Feb. 12 at 12:01 a.m. and has been updated. The freedom of navigation operations, also known as FONOPS, could be carried out by ships with the San Diego-based Carl Vinson carrier strike group, which is in the Pacific Ocean heading toward the South China Sea, according to three defense officials who spoke to Navy Times on condition of anonymity to discuss operations in the planning phase. The military’s plans likely call for sailing within 12 nautical miles of China’s newly built islands in the Spratly and/or Paracel islands, a move that would amount to a new challenge to Chinese maritime claims there that has raised tensions between Washington and Beijing in the recent past. India’s navy is in the hunt for a new foreign fighter jet after rejecting an indigenously made aircraft as too heavy, the latest sign of the struggle to get Asian militaries to buy locally to grow their defense industries. The navy last month invited manufacturers to pitch for 57 planes for its aircraft carriers, a multi-billion dollar order the government had hoped would go to the state-run producers of India’s Tejas, a combat aircraft 33 years in the making. India, South Korea, Taiwan and other Asian buyers are expected to intensify efforts this year to develop indigenous warplanes, military officials said, due to anxieties that the United States may be less engaged in the region under President Donald Trump. At least 18 people, including DIG Traffic Ahmed Mobin, were killed and over 90 wounded in a suicide bombing outside the Punjab Assembly in Lahore on Monday, policemen and rescuers said.